The Farmhouse Cheeseburger is just your typical cheeseburger – charbroiled beef patty, cheddar cheese, lettuce, tomato, onion, and pickles. Oh yeah…it also comes with grilled smoked pork belly and a fried egg! Okay. Maybe not so typical after all. Sounds delicious, right? Unfortunately, the description read better than it actually tasted. My burger patty was overcooked and incredibly flavorless. The pork belly, which I was especially looking forward to, had such a strong smoke flavor that it overwhelmed the entire burger. I did enjoy the beautifully runny egg that it was topped with, but sadly, that’s about it. 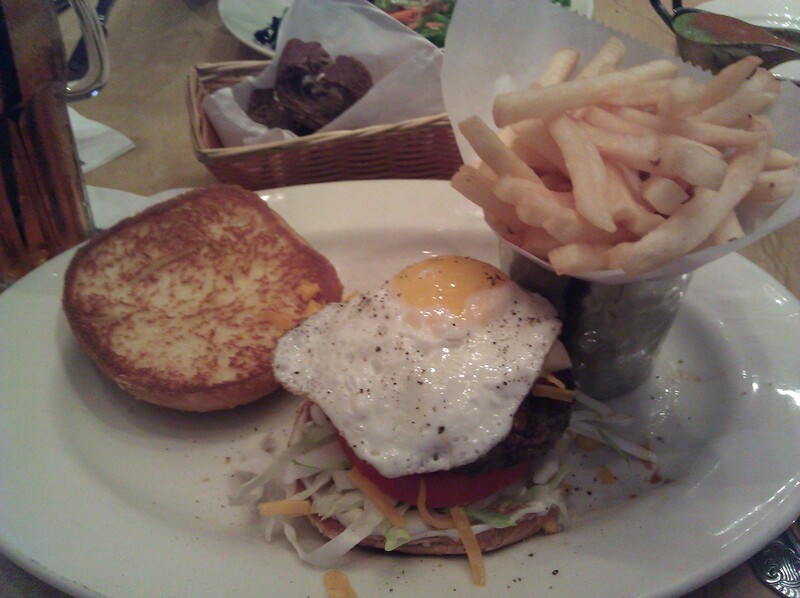 The Cheesecake Factory makes some mind-blowing cheesecakes and a number of other tantalizing dishes, but the Farmhouse Cheeseburger was just nowhere near where it should have been. A few weeks later, the wife accompanied me to Red Robin Gourmet Burgers in an attempt to satisfy the burger craving that The Cheesecake Factory had left behind. 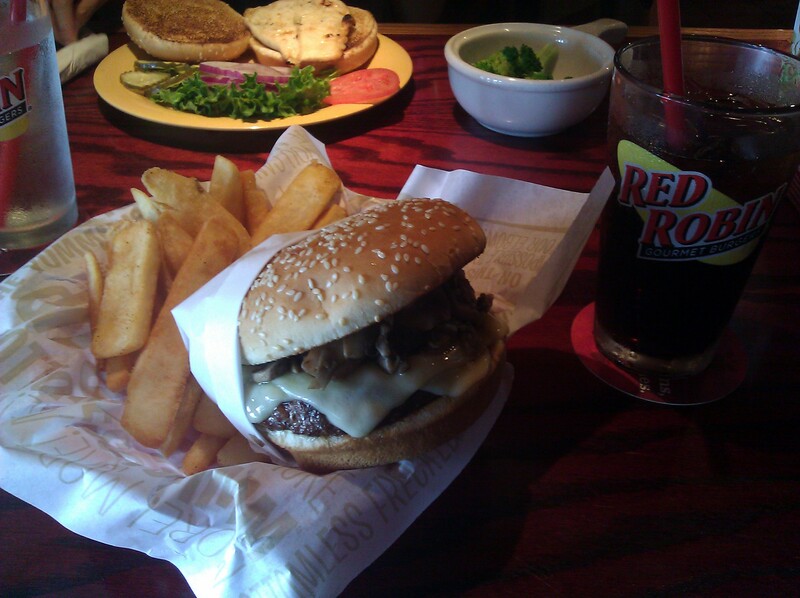 I hadn’t been to Red Robin in a number of years, but I remembered it being quite tasty. I ordered the Sauteed ‘Shroom, a burger topped with sauteed mushrooms (hence the name), Swiss cheese, and a garlic parmesan spread. Well…turns out my memory’s not so good. Maybe they didn’t season my patty properly or maybe they just didn’t add enough of the garlic parmesan spread. Whatever the case was, my burger was bland. Bite after bite, I kept hoping that the flavor would hit me, but I didn’t even get as much as a poke. To get my money’s worth, I ate two baskets of their perfectly golden steak fries and downed three glasses of soda. Notice the snow white chicken breast in the background with the side of steamed broccoli? Yup…that’s how my wife rolls.